Today we’d like to introduce you to Steph Zabel. Thanks for sharing your story with us Steph. So, let’s start at the beginning and we can move on from there. My upbringing as a young girl in South Carolina was the catalyst for my herbal interests. I spent a lot of time at my grandparents’ house in the country, walking in the woods. My whole family seems to have an affinity for the botanical world, and I learned a lot about plants from my grandmother and mom. When I went to college I decided to study horticulture and biological sciences, and took many outdoor field botany classes which made me fall even more in love with the plant world. This then led me to graduate studies in ethnobotany, which in turn led me to study traditional herbalism. Once I started dedicating myself to learning more about herbs I realized that it was the true path for me. I felt called to help connect people to healing plants, especially for city-dwelling folks who often feel disconnected from the natural world. I have been working with — and continuing to learn about — herbs ever since. It truly is a lifelong path. 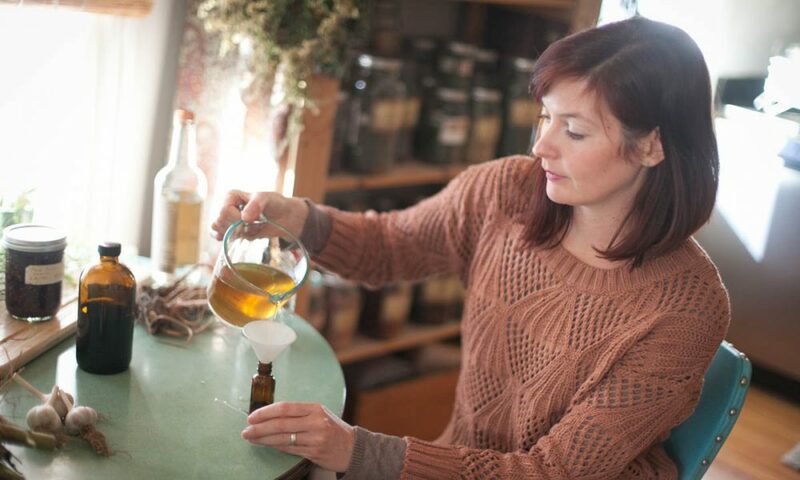 Becoming an herbalist is a winding path that requires dedication; having your own herbal business requires even more persistence and dedication in order to be successful. I started out slowly: I worked a full-time day job while I built my herbal business on the side. Eventually, after several years — once I was more established — I took a very scary leap-of-faith and decided to make herbalism my full-time work. I quit my day job and struck out on my own. It was not easy to do this, but having built a strong business base for many years made it more do-able. Today I feel very fortunate to be able to do this work (of offering herbal classes and educational opportunities) and to be at the head of a business that is fulfilling, challenging and dynamic. So let’s switch gears a bit and go into the Flowerfolk Herbs and Herbstalk story. Tell us more about the business. I have a two-part business: On one side is Flowerfolk which is the outlet through which I offer small herbal classes and local plant walks. I specialize in herbal education for individuals who want to learn more about practical, healing herbs that they can use at home for themselves and their families. I am passionate about teaching people about plants and connecting them with herbs, and my classes aim to make herbalism as accessible and straightforward as possible for people. My other business is Herbstalk, which is a larger, community-oriented educational event that takes place twice a year. Through this event we bring together herbalists from all over New England, and offer over 40 classes and plant walks in our two-day long event. We also host a large marketplace of practicing herbalists, crafters and plant people. Although I am very biased, I think that Herbstalk is an amazingly vibrant event that helps city dwellers feel more connected to the natural world, to plant medicine, and to one another. It is the highlight of my work year, each and every year! Over the past decade I have seen interest in herbs and herbalism soar, and I suspect that it will only continue to do so in the near future. People are seeking alternative ways to recover and/or promote their health, and are turning to more natural, more gentle ways to do so. It also seems that people are experiencing an awakening in regards to the natural world: I see more and more people who want to learn about the plants that grow around them (even in their city environs) and increased awareness about the inter-connectedness of plant life with human life. I think it is an exciting time to be an herbalist and to offer this traditional knowledge to a wider audience.